Much has been said about the use of chiasmus in the Book of Mormon. The early prophet-writer Nephi was one of the most skilled authors at using this literary form, and he employed it in a number of ways. 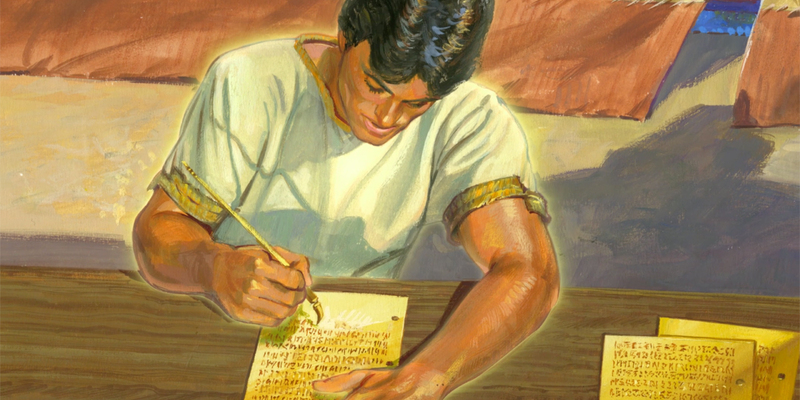 The most important way Nephi used it, however, was to testify of Christ. For example, Nephi used chiasmus as a means of centralizing Isaiah’s important witness of the Messiah. As John W. Welch noted in 1981, 2 Nephi “begins with Lehi’s final Testaments to his sons, grandsons, and sons-in-law. It ends with Nephi’s Testament to his nation,” and in the middle sits Isaiah. The Law of Moses and everything else God has revealed typify Christ. The creation itself depends on Christ. In all of these ways, Nephi’s central emphasis on Christ in 2 Nephi is in keeping with one of the foundational rules of chiasmus set forth by Nils Lund in 1942, that because the center of a chiasm is the focus of the chiasm, references to deity are typically concentrated there at the center of strong uses of chiasmus. This is exactly what one finds in 2 Nephi. It may be easy to look at chiasmus in the Book of Mormon simply as a curiosity or a subtle evidence of its authenticity. However, scholarship suggests that it can be much more than this. Scholar Dennis Newton has determined through statistical analysis that Nephi’s chiasms were almost certainly intentional. If this is the case, then Nephi deliberately used chiasmus to make many powerful points about the centrality of Christ to his life and to creation itself. These are points that the modern reader could easily miss if they failed to notice the chiasmus in the chapter or were unaware of how chiasmus worked. As one looks at 2 Nephi with chiasmus in mind, it suddenly becomes more evident how central Christ is to the book of 2 Nephi. For example, 2 Nephi 11:2–8 centers on the idea that the covenants of the Lord typify Christ. 2 Nephi 25:24–27, similarly, emphasizes that Christ is the center of their religious observations, even though they were keeping the Law of Moses. The name “Christ” appears 53 times throughout 2 Nephi, often within chiasms that emphasize different parts of Christ’s character or mission. Looking carefully at Nephi’s use of chiasmus can help readers to understand Christ better, because it can help them understand better what Nephi said about Him. Christ is the dominant character throughout the entire Book of Mormon, and knowing how the ancient authors of the book expressed this idea can help modern readers to notice more about the Savior and to appreciate more specifically His centrality in all things. Dennis Newton, “Nephi’s Use of Inverted Parallels,” Interpreter: A Journal of Mormon Scripture 22 (2016): 79–106. David E. Sloan, “Nephi’s Convincing of Christ through Chiasmus: Plain and Precious Persuading from a Prophet of God,” Journal of Book of Mormon Studies, 6, no. 2 (1997) 67–98. See, for example, John W. Welch, “Chiasmus in the Book of Mormon,” in Chiasmus in Antiquity, ed. John W. Welch (Hildesheim: Gerstenberg, 1981), 198–210; Book of Mormon Central, “Why Is The Presence Of Chiasmus In The Book Of Mormon Significant? (Mosiah 5:10–12),” KnoWhy 166 (August 16, 2016). David E. Sloan, “Nephi’s Convincing of Christ through Chiasmus: Plain and Precious Persuading from a Prophet of God,” Journal of Book of Mormon Studies, 6, no. 2 (1997): 67–98. Sloan, “Nephi’s Convincing of Christ through Chiasmus,” 69. Welch, “Chiasmus in the Book of Mormon,” 201. For another example of a chiasm that focuses on Christ, see Book of Mormon Central, “Why Was Chiasmus Used In Nephite Record Keeping? (Helaman 6:10),” KnoWhy 177 (August 31, 2016). Jeffrey R. Holland, Christ and the New Covenant (Salt Lake City, UT: Deseret Book, 1997), 36. Based on working paper, “The Chiastic Structuring of Large Texts: Second Nephi as a Case Study,” by Noel B. Reynolds, December 30, 2016. Based on Sloan, “Nephi’s Convincing of Christ through Chiasmus,” 74–75. Sloan, “Nephi’s Convincing of Christ through Chiasmus,” 75. Newton, “Nephi’s Use of Inverted Parallels,” 82–83. Dennis Newton, “Nephi’s Use of Inverted Parallels,” Interpreter: A Journal of Mormon Scripture 22 (2016): 93. Newton, “Nephi’s Use of Inverted Parallels,” 97. Sloan, “Nephi’s Convincing of Christ through Chiasmus,” 68. Nephi, Joseph Smith, Matthew, nor Zacharias were smart enough to use chiasmus as a literary tool. Chiasmus is a poetic form used by God to denote the source of his word as one who knows the beginning from the end and the end from the beginning. It demonstrates the most gentle instruction and persuasion. Also, I believe that since the purpose of the Book of Mormon is for the convincing of the Jews and Gentiles that Jesus is the Christ, Nephi, Mormon and Moroni all engaged the use of an ancient literary method that would be familiar to Hebrew scholars.